Book an unmatched Hilton Dubai car hire deal from UAERentalCars today! Book a car rental for Hilton Dubai Jumeirah Resort if you’re looking forward to explore the city at your own convenience. Working with some of the foremost car hire brands, UAE Rental Cars provides you with the finest deals. As airport fee, road fund tax and VAT local tax are already included in our prices, you don’t need to worry about any kind of hidden charges. Use our advanced reservation form to choose from the various car rental deals for Hilton Dubai Jumeirah Resort. Why is it Better to Rent a Car at Jumeirah Hilton Dubai? If you’ve decided to stay at Jumeirah Hilton Dubai during your tour of Dubai, then you’re highly recommended to rent a car at the hotel. Most of the travelers visiting Dubai find the option of car rental more sensible as compared to taxis or public transport. Taxis can make a dent in your budget while public transport does not cover every corner of the city. With well-maintained, clean, wide roads and easy-to-follow signage, Dubai is a city that can be best experienced by driving a car around its streets. So make a wise decision of renting a car at Jumeirah Hilton Dubai and give yourself the chance to explore Dubai and the nearby emirates with ease. 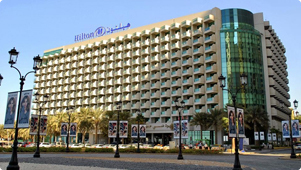 Situated near Jumeirah Beach, Hilton Dubai is one of the finest luxury hotels of UAE. Strategically located, the hotel is surrounded by number of tourist hotspots, making car rental a very popular choice among visitors. Featuring more than 400 rooms and private suits, Hilton Dubai offers wide range of leisure facilities. The multi-cuisine restaurants are well stocked to offer continental, Mexican, American, and Arabic dishes. Rent a car at Hilton Dubai and start your sightseeing trip uninterrupted. 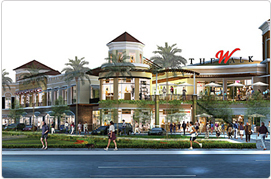 Ideally situated to discover the marvels of the Persian Gulf, The Walk is very close to Hilton Dubai. Select from a rich variety of bars and restaurants or take a leisure stroll along the popular shopping mile. 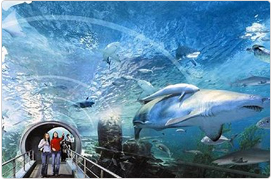 Creating a fascinating ocean environment, the Dubai Aquarium and Underwater Zoo is a famous tourist destination. Besides watching animals, you can take part in variety of outdoor activities. Drive your rental car to the Gold Souk that apparently shows why Dubai is famously called City of Gold. 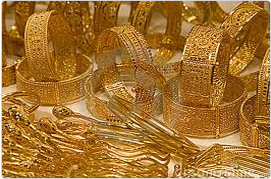 It’s worth your time to see the place glinting with retail outlets exclusively selling variety of gold jewelery. 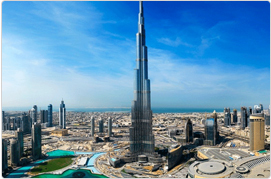 One of the world-class destinations of UAE, the Burj Khalifa is located in Downtown Dubai. Surrounded by hotels, shopping malls, and entertainment venues, the world’s tallest building is a must visit. Rent a car at Jumeirah Hilton Dubai in just 3 easy steps. Select Jumeirah Hilton as your location, choose from a huge fleet of cars & make payments through SSL secured portal. Taking your car rental reservation process to next level, we have come up with a phone booking service. Our customer care team makes your Hilton Dubai car rental booking an effortless service. Renting a car at Hilton Dubai Jumeirah saves you from the hassles of arranging a taxi or public transport. Save big on your traveling costs and time with Hilton Dubai car rental of your choice.